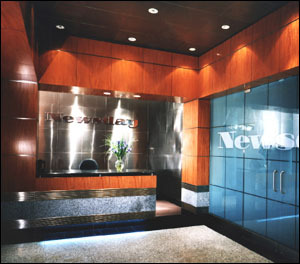 Premier decorative laminate glass is a favorite of the architectural and design community. 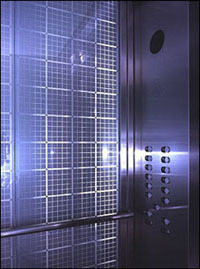 Laminate glass is manufactured by encapsulating a decorative interlayer between two or more layers of adhesive and two or more panes of glass. Proprietary technology and dedicated equipment insures a permanent bond. The decorative interlayer consists of many different materials such as: Printed films, rice papers, fabrics, woven wood, fiber tones, weaves, metallic holographic films, and aluminum. SGO Designer Glass welcomes the opportunity to laminate customer supplied or specified materials with its laminate glass process. Please contact us for testing of these materials to insure compatibility with our process and your application. 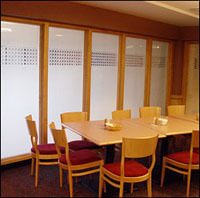 Different types of glass and different colors can also be used as long as it has one smooth surface suitable for lamination. Average fabrication lead time is 3 to 5 weeks from the completion of designs.